“Kodai Alumni and Community Initiatives: Khelshala Project,” 7 Roads: Kodai Alumni Magazine, Issue 4, Kodaikanal, Tamil Nadu, India, October, 2015. “Alumni in Focus: Bridging East and West with Sports – Tariq Mohammed,” Kodaiites: A Newsletter written for Alumni by Alumni, Kodaikanal, Tamil Nadu, India, December, 4, 2013. Chandpuri, H. “Khelshala Radio Interview.” https://tariqmo.files.wordpress.com/2017/01/khelshala-tariq-sir.mp3 Academy of Broadcasting, Chandigarh, India, August 2013. Shea, J. “Coach’s Corner: Tariq Mohammed,” The Centipede: Concord Academy Student Newspaper, Vol. 49 Issue 5, Concord, Massachusetts, United States, February 5, 2013. Dorning. A.M, “Newsmakers,” Concord Academy Magazine, Concord, Massachusetts, United States, Spring 2012. Prince, J. “USOC Coaching Awards Announced,” Squash Magazine: Official Publication of US Squash, April/May, 2012. Stoffers, B. “February’s Featured Member: Tariq Mohammed,” Athletic Coach Education, Vol. 2 Issue. 2, United States, February 17, 2011. “On Campus: Items about Andover residents pursuing degrees,” Andover Townsman, Andover, Massachusetts, United States, November 18, 2010. Ssebaggala, N. “Tariq conquered as top seeds set up yellow final,” The Monitor, Kampala, Uganda February 8, 2003. 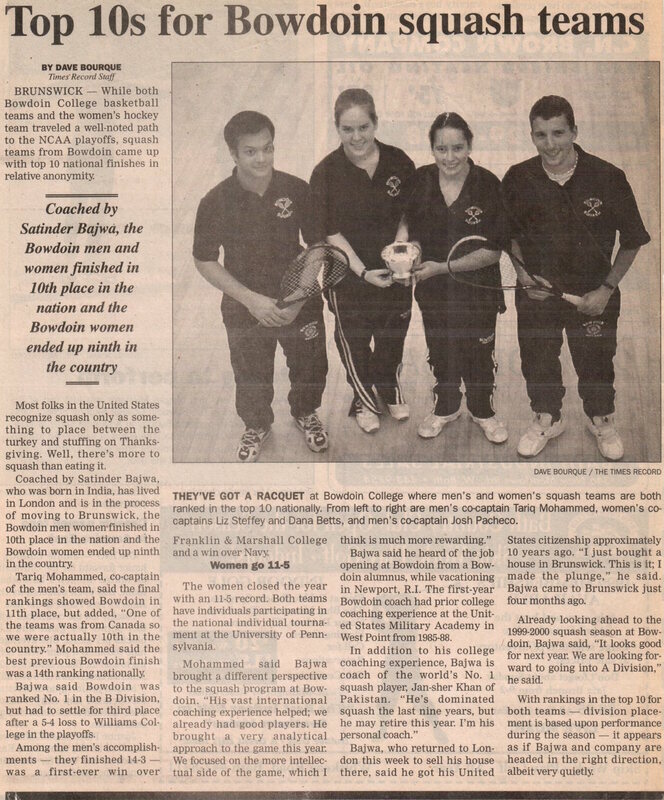 Bourque, D. “Top 10s for Bowdoin squash teams,” The Times Record, Brunswick, Maine, United States, 1999. Malia, J. “Senior Profile: Tariq “Tiger” Mohammed ’99,” Bowdoin Orient Sports, Brunswick, Maine, March 12, United States, 1999. McClennen, A. “Bears finish 10th in the country,” Bowdoin Orient Sports, Brunswick, Maine, United States, March 12, 1999. White-Jones, H. “Men’s College Season Heats Up,” Squash News, Brunswick, Maine, United States, March 10, 1996. “Underdogs hold sway in league,” Gulf News, Dubai, United Arab Emirates, June 4, 1995. “Dubai clinch inaugural squash challenge,” Khaleej Times, Dubai, United Arab Emirates, May 7, 1995. “Young talent on display.” Khaleej Times, Dubai, United Arab Emirates, April 13, 1995. “Jeevahan pips Arif for title,” Gulf News, Dubai, United Arab Emirates, April 13, 1995.